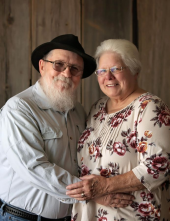 Kenneth L. Reed age 70 of Tabor, Iowa died April 7, 2019 at the Buffet Cancer Center in Omaha Nebraska, after a long battle with cancer. He was born August 25, 1948 to Margaret June Mc/Clary Reed and Kenneth Ralph Reed the 1st of 5 children. He graduated from Tabor High School in 1965, after which he attended and completed diesel mechanic school. He is a lifelong resident of the Tabor community. He married Sherry Bacon Reed on October 12, 1970. Ken was an avid gardener and lawn care guy. He enjoyed the outdoors and working with his hands. He retired from the Fremont-Mills High School in 2010 after 30 years of service in Maintenance and Grounds keeping. He continued to do lawn work for several in the community until his health would no longer let him. Ken was well known in the community and always there to give some advice to the young folks. He was known as Ken Ken due to the intercom system paging him to the office at the school many times a day. He was a wonderful son, father, husband, brother and grandfather. Funeral services will be 10:30 AM Friday, April 12, 2019 at the Crawford-Marshall Funeral Chapel in Tabor, IA with Mr. Gary Moles of the Bartlett Community Church officiating. Visitations will be open after 5:00 PM Thursday at the Funeral Chapel and the family will greet friends from 9:30 AM to 10:30 AM Friday also at the Funeral Chapel. Memorials will go to the Tabor Public Library Building Fund and interment will be in the Tabor, Iowa Cemetery. The Crawford-Marshall Funeral Chapel in Tabor, IA is in charge of arrangements. To plant a tree in memory of Kenneth L. Reed, please visit our Tribute Store. "Email Address" would like to share the life celebration of Kenneth L. Reed. Click on the "link" to go to share a favorite memory or leave a condolence message for the family.